Caledonian Macbrayne runs a ferry service from Mallaig to the Small Isles 6 days a week. Tel: 0800 066 5000. Cycles can be carried for a small charge. No cars (except residents'). You stand a good chance of seeing whales, dolphins and porpoises. A trip on the CalMac ferry allows you to see most of the islands on a day cruise. You can get combined bus/ferry tickets from Fort William to Mallaig and then cruise to the Small Isles. Visit the CalMac ferry web site for details. MV Western Isles offers cruises to Loch Nevis (Inverie and Tarbert) from Mallaig harbour. Children go half-price. Tel: 01687 46 23 20. AquaXplore is an offshore RIB (Rigid Inflatable Boat) operating from Elgol on Skye to the isles of Rum and Canna. Advance booking recommended. Telephone 01471 866 244 or freephone 0800 731 3089. Sea.Fari Adventures offers scheduled boat trips from Mallaig and Armadale on Skye to cruise around the Small Isles and Loch Nevis (Knoydart) and go whalespotting. Contact Peter Fowler. Tel: 01471 833316 / Mobile: 0797 3509387. Arisaig Marine runs cruises to the Small Isles giving you between 2 and 5 hours ashore on the islands of Eigg, Muck and Rum. The MV Sheerwater operates daily timetables from late April until late September, departing Arisaig at 11am. Tel: 01687 450224. The harbour office also contains a tea room, showers, toilets, shop and a laundrette. Based at the pontoons in Kyle of Lochalsh, Red Moon Cruises offer tailor made holidays for up to 4 people sleeping in 3 cabins (1 double and 2 single). The cruising area covers Skye, Knoydart, the Small Isles, Wester Ross and the coastline north and south of Lochalsh. Contact Scott and Mary. Tel: 07768 101667. For any quiz participants out there looking for the colloquial name for the Small Isles, the answer you are probably looking for is "cocktail islands", a phrase which is thought to have been used by a journalist several years ago, although is not really used locally. North West Frontiers offer guided walking trips to the Small Isles. Bought by the Nature Conservancy Council (now called Scottish Natural Heritage) in 1957, it is one of Scotland's finest National Nature Reserves. It is of international importance for many of its plants, habitats and birds. SNH offer guided day walks in the summer, looking at the nature, wildlife, archaeology and geology of the island. Visitors are welcome to follow the 2 simple nature trails laid out around the village. Visit the Scottish Natural Heritage web site to download PDFs about Rum. On a visit to Rum you may be rewarded by sightings of deer, otters, seals, goats and eagles. Over 100,000 Manx shearwaters nest in the hills. Be warned though, the island is said to have the highest rainfall in the Inner Hebrides thanks to its 2000 foot high mountains which catch all the clouds coming in from the Atlantic. And the midges are huge apparently! The island has a population of around 22 (2011 census). Rum was the site for the reintroduction of sea eagles in Scotland. The red deer research by Edinburgh and Cambridge Universities is one of the longest running studies of a population of large mammals anywhere in the world. The Rum Cuillin mountains are the remains of a huge, ancient volcano and attract geologists from all over the world. Deposits of platinum and other minerals have been found on the island by scientists from Essex University in England - but not enough to start mining! Overlooking Loch Scresort, a sheltered bay halfway up the east coast where the ferry arrives, sits the reddish form of Kinloch Castle, an extravagant Edwardian dream, built by wealthy industrialist George Bullough in 1900. It was featured in the BBC 'Restoration' competition in 2003. Guided tours take place daily from April to October - phone 01687 462 037 to avoid disappointment. 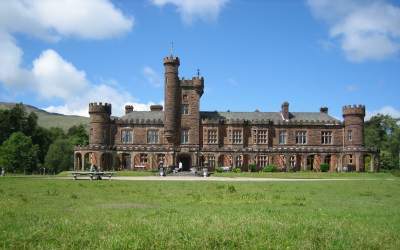 Kinloch Castle Friends Association, founded in 1996, is a registered Scottish Charity. In January 2019, they launched a Crowdfunder campaign to help pay for ongoing costs as they work towards asset transfer of the castle from Scottish Natural Heritage. Kinloch means 'at the head of the loch'. The Bullough family mausoleum can also be visited if you want to walk over to it on the other side of the island. It is thought that George Bullough changed the island's original Gaelic name from Rum to Rhum because he didn't want the island associated with the alcholic drink and it was then changed back to its original name in 1991 by the then Nature Conservancy Council. Please note that the Hostel at Kinloch Castle is currently closed. Rum Bunkhouse (built in 2014) sleeping up to 20 people in 4 mixed dorms and 1 twin room. Suitable for individuals, families or groups. Lounge, dining space and 2 self-catering kitchens. Wheelchair access. Free WiFi. Tel: 01687 460318. Ivy Cottage Guest House offers dinner, bed & breakfast accommodation in 2 ensuite rooms. Contact: Fliss and Sandy on 01687 462744. Camping: there is a basic camping area by the shore of Loch Scresort, with 2 toilets, 2 hot showers, fresh water taps and 2 camping shelters. 10 minutes walk from the ferry terminal. 5 minutes walk from Kinloch Castle. First come, first served. Tel: 01687 462404. Click here for more details. Can get midgey when it's not windy! Camping cabins are also available. 2 bothies (at Dibidal and Guirdal) run by the Mountain Bothy Association. Check isleofrum.com for details of all available accommodation on the island. There is a well stocked shop in the village. Apart from groceries it also sells local crafts, postcards, stamps and souvenirs. The Village Hall is always open for people to use to escape from the rain or midges or both!! A cafe/teashop is available there several afternoons a week during the summer. It offers tea/coffee, cake, soup and other home made food. Phone 01687 462026 to checking opening times. Rum Crafts has a craft shop on the shoreline near the village. Bike Hire is available from the craft shop. Contact Fliss Fraser. Tel: 01687 462744. The Rum Community Ranger service has a programme of guided walks and talks from Monday - Friday during the summer plus a wildlife cruise and otter watch - tel: 01687 462404. The otter hide is situated along a path which is easily reachable from the ferry terminal (turn left at the top of the pier). For local news, read the report from Rum every month in the local community newspaper West Word. For Books about Rum - see below. Eigg is the second largest in the Small Isles group. Its distinctive outline is provided by a sloping ridge of lava known as the Sgurr which runs down the island like the backbone of some prehistoric creature. In fact the name Eigg comes from the Gaelic word meaning 'notch'. If you walk along the road from the pier through the moors, you will reach Laig Bay. About a mile to the north are the Singing Sands of white quartz. There are also a few historic ruins on the island including Iron Age forts, a 6th century Christian church and Viking burial mounds. The island has been bought and sold several times in the past. Not all of the owners have been particularly liked by the inhabitants whose supplies are transported on the ferry from Mallaig. After many empty promises, the German owner who bought it in 1995 put the island up for sale. 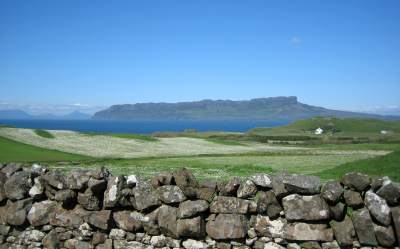 In August 1996, the islanders launched a public appeal to raise money so that Eigg could be properly managed by the islanders themselves in partnership with the Scottish Wildlife Trust and the Highland Council. In April 1997 their offer of 1.5 million pounds was finally accepted and they happily took possession on 12 June 1997. By the ferry pier, the Galmisdale Bay Cafe, Bar & Restaurant (formerly known as the Eigg Tearoom) offers food all day (Tel: 01687 482487). Closed Wednesdays and Sundays. Next door is a fully licensed shop with post office and crafts. A minibus meets the ferry and can give you a lift. Eigg Adventures offers bike hire plus wilderness trips with kayaking, mountain biking and walking. Tel: 01687 315012. The Cleadale Crofting Museum (or Tigh Iain Dhonnachaidh - Gaelic for croft number 6) shows the way people used to live on the island. It is looked after by Eigg History Society in an old blackhouse. Admission free. Donations welcome. To find out what's happening on the island today, read the news report from Eigg every month in the local community newspaper West Word. Photos and more info are on the Eigg community web site. The population of this vibrant island grew from 67 in 2001 to 83 in 2011 according to the official census figures. Eigg Box will be a workspace on Eigg for island-based artists and creative businesses to share with visiting artists from Scotland and beyond. As well as different sized work spaces, Eigg Box might also have a small exhibition area. Sue Kirk, Lageorna, Isle of Eigg PH42 4RL. Tel: 01687 482 405. Self catering cottage, bed and breakfast and restaurant. 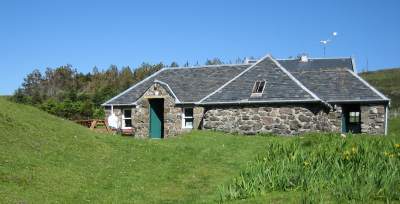 The Earth Connections Eco Centre in the old Lodge runs residential eco courses and holidays to promote green living. Courses feature beekeeping, bushcraft, renewable energy, 'the Good Life', ecology, etc. while holidays can include yoga, wildlife watching and much more. Contact Norah and Bob Wallace. Tel: 01687 482495. The Glebe Barn. Field Study and Outdoor Centre and self-catering independent hostel (24 beds), 1 mile from harbour. Ideal for groups. Contact Tamsin & Stuart McCarthy. Booking essential. Tel: 01687 315 099. Campsite at Cleadale (north end of the island) in a designated area. Bothy also available. Contact Sue Hollands (tel: 01687 482480). Eigg Yurts. Contact Sue or Neil. Tel: 01687 482480. Cuagach Bothy - traditional one-roomed stone building at the north end of the island overlooking Laig Bay. Contact Maggie Fyffe. Tel: 01687 482486. Sandavore Bothy is located at the foot of the Sgurr hills in an isolated spot overlooking the sea. This renovated shephard's dwelling offers basic self-catering accommodation for up to 4 people. Contact Sue Hollands. Tel: 01687 482480. More details about various self catering properties are given on the Eigg community web site. For Books about Eigg - see below. Run as one large farm, the island is the smallest and flattest of the group, but there is still lots to see and do for those who enjoy getting away from it all. Population around 30. The craft shop, tearoom and restaurant have a wide range of meals available (tel: 01687 462990 or 01687 460057). The Green Shed sells crafts and offers craft courses. Port Mor House is a large self catering property situated near the pier. It has 9/10 bedrooms, 4 bathrooms, sitting room, dining room, kitchen. It can sleep 14 people. Contact Judy and Ewen. Tel: 01687 462218. Gallanach Lodge: newly built luxurious accommodation with 8 bedrooms offering Dinner, Bed & Breakfast. Contact Mary and Toby Fichtner-Irvine. Tel: 01687 462 365. Godag House B&B: half a mile north of the harbour. 1 double room and 1 twin room. Optional evening meal using local produce when available. Contact Julie or Dave - tel: 01687 462371. Carn Dearg B&B in Port Mor has 2 bedrooms (1 double & 1 twin). Evening meals are available. Contact David or Libby Barnden - tel: 01687 462363. The Bunk House (near the The Craft Shop & Tearoom): 4 small bedrooms (3 rooms with bunkbeds and 1 double room), kitchen, living area, 2 toilets and shower. Contact Rosie Soutter. Tel: 01687 462042. Camping on the island is free of charge but check at the Craft Shop for good sites. The furthest of the Small Isles from the mainland. From afar, it appears small and whale-shaped, with a solitary stack rising out of the sea near the east coast. Currently in the care of the National Trust for Scotland and with a population of around 20. Looking out over to Skye sits Compass Hill, so called because the iron in its basaltic rock affects compasses up to three miles away. This is a beautifully scenic island and a car is not really needed for exploration (vehicles are only allowed by permit from the National Trust for Scotland). 10 safe yacht moorings are available to visitors at £10 per night per mooring. The Canna Feis (Gaelic festival) is usually in August. The community shop sells gifts and handmade crafts. Café Canna opens for the summer season from April to September. They serve light snacks, lunches and evening meals. Open daily except Tuesdays. Tel: 01687 482 488. Saint Columba's Presbyterian Church was built in 1913 and has a very nice ornamental wrought-iron gate. Rarely used nowadays, it is called the 'rocket church'. The Roman Catholic church, originally built around 1770 is St Columba's and has a plaque in memory of Margaret Fay Shaw and John Lorne Campbell who lived in Canna House. Canna House and its amazing archives will be open to visitors in 2020. The Canna Local History Group has a useful web site. Ray Perman, author of The Man Who Gave Away His Island, A Life of John Lorne Campbell of Canna, writes a blog about Canna. The Canna Community Development Trust has a wealth of info about visiting the island. Connected to Canna by a wooden bridge is the tidal island of Sanday. St. Edward's Chapel is being restored as an arts centre. Tighard Guest House has 3 double/twin rooms. Tel: 01687 462474. 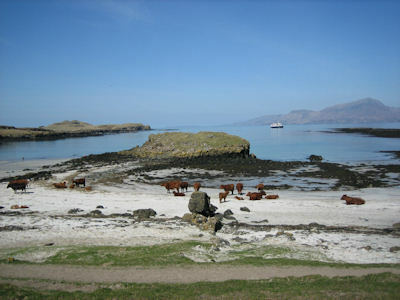 The National Trust for Scotland offers self catering on the island. The Canna Campsite has tent pitches, camping pods and caravans for visitors. Toilets, showers and a drying room. Pets welcome. Contact Isebail MacKinnon tel: 01687 462477. Canna: The Story of a Hebridean Island was written by former owner John Lorne Campbell who deeded the island to the National Trust for Scotland. Available as a paperback from Amazon.com and Amazon.co.uk. His widow, an American lady called Margaret Fay Shaw (Campbell), who lives in Canna House, wrote her autobiography From the Alleghenies to the Hebrides. First published in 1995, it is recommended as a very good read. It is available from Amazon.com and Amazon.co.uk (January 2000 paperback edition). The Man Who Gave Away His Island: A Life of John Lorne Campbell of Canna is a biography by Ray Perman. 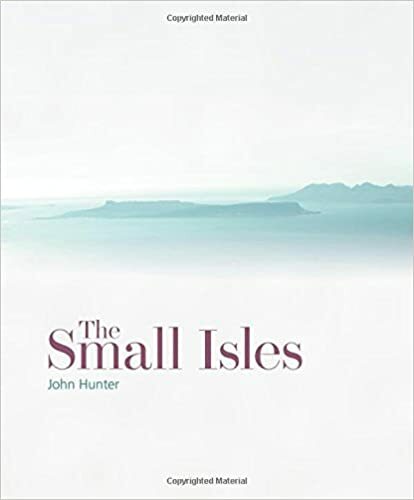 Explore the history and heritage of the Small Isles in John Hunter's 2016 book for Historic Environment Scotland. This reference book has some excellent photos. Read the fascinating tale of one of the Hebrides unique thriving small communities through the colourful anecdotes of Lawrence MacEwen, whose family have owned the island since 1896. A wonderfully benevolent, and eccentric character, his passion and love for the island and its continuing success, has always been of the utmost importance. Author: Polly Pullar. Published in July 2014. For many a spectacular skyline and magnificent scenery is their first awareness of the islands off Arisaig and Mallaig, yet their history is as central as their geographic situation to the story of the Hebrides. It was their misfortune that economic change and historical accident led to their marginalisation and the loss of so much of that extraordinary past. This is the first book ever to be written on the collective history of these 4 islands. It provides a wide ranging, fresh and provocative analysis of these islands and their history. Includes maps, population tables, details of stone crosses, some b/w photos. Author: Denis Rixson. Paperback. 223 pages. Published in June 2001. This new book by John A. Love reveals the human story of the island of Rum, both in the tragedy of the clearance and in the interlude of the Bullogh period when the folly at Kinloch was built. It also covers the history of the island stretching back to the mesolithic period and the earliest settlements in Scotland. Includes sections of old b/w photos, colour photos and portraits. Hardcover. 317 pages. Published in July 2001.
Review by HIGHLAND NEWS: If you have already been to Rum, then this book will make you return. If you have never been to Rum you will just have to go to this magical island. Thoroughly researched and written in a lively accessible style, the book includes comprehensive coverage of the island's geology, animals and plants, and people, with a special chapter on the Edwardian extravaganza of Kinloch Castle. There is practical information for visitors to what was once known as the Forbidden Isle; the book provides details of bothy and other accommodation, walks and nature trails. It closes with a positive vision for the island's future: biologically diverse, economically dynamic and ecologically sustainable. Written by Camille Dressler (a French resident on the island). Following the ownership battle for the island in 1997, this text tells the story of Eigg, from its earliest inhabitants to the present, detailing its recently-acquired independence and community ownership. The book draws extensively on oral history from the islanders themselves and from local archives, with stories of clans, pastimes, wartime, childhood and crofting. Other accommodation is available on the mainland around Mallaig, Morar and Arisaig. See the Road to the Isles web site accommodation page.